Zion's east side is dominated by nameless domes, hoodoos and valleys. Works of art, patiently provided by natures insurmountable havoc. In its wake, it turned lofty piles of sand into a magnificent gallery of textured slickrock. Water-filled potholes, twisted rock and alabaster stone dot the arid landscape. The signature landmark on the east side of the park is the vertically and horizontally striated, Checkerboard Mesa. The path to Checkerboard Arch has a little bit of everything including: slickrock scrambling, bushwhacking, route finding, soft sand hiking and arches. Blind arches, as seen along the trail, are common on the east side of Zion, but there are only a dozen or so freestanding arches in the park. Beauty abounds along the trek with Checkerboard Mesa to the east, "Quilt Mountain" to the west and expansive vistas above Parunuweap Canyon emerge ahead. Difficulty: This route is moderately difficult, but route finding skills are required. Equipment: USGS 7.5 Minute Topographic Map "The Barracks." At least 3 quarts of water per person, clothing appropriate for the weather, sticky hiking shoes, emergency medical supplies and emergency equipment. Sun Exposure: Full sun in most places. Trail Conditions: This is an un-maintained route, rather than an actual trail. The path goes through a wash and along slickrock to an arch in Zion's backcountry. Trailhead: The second pullout south of the Checkerboard Mesa parking area. Trail Access: Zion-Mt. Carmel Hwy (SR-9) is open year-round. Highest Point: The Saddle is 6100 feet and the Checkerboard Arch Viewpoint: is 5800 feet. Restrooms: There are vault toilets at the east entrance station, but they are usually closed in the winter. Water: No reliable water source. Checkerboard Arch was spotted along a hike to Parunuweap Canyon and is now called Checkerboard Arch by the locals. 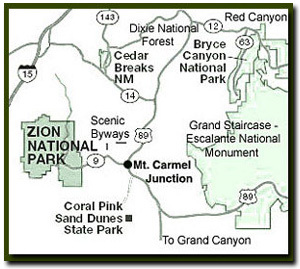 Even though the arch does not sit on Checkerboard Mesa, the route runs along both sides of the famous Zion landmark. Trail access without getting on the Zion Canyon Shuttle, which is nice because you have access to your car and everything in it which is parked at the trailhead. A remote hike, showcasing some of the unique beauty of Zion's east side and of course a look at one of the rare freestanding arches in Zion National Park. This is a more difficult hike that takes hikers to a plateau near the summit of the famous Zion National Park landmark - Checkerboard Mountain. Trailhead - Park at the second pullout which is located just southwest of the main Checkerboard Mesa viewpoint. Cross the highway, to the south, and look for the path of use along the narrow drainage. Follow the drainage that is west of Checkerboard Mesa and east of Crazy Quilt Mountain, mountain to the west of Checkerboard Mesa. There are actually two drainage's, however the one closer to Crazy Quilt Mountain affords the easiest travel. This is not a maintained trail so be prepared to climb obstacles such as fallen trees. Follow the wash until the beaten dirt path becomes obvious on the left. The "trail" will cross the drainage several times, but it is generally easy to find on either side of the wash. Travel directly in the water course when possible to prevent soil erosion. The "trail" gets steep at the one-mile mark where the head of the canyon is approached. The short .35 mile climb ends at a saddle (6100 feet). Looking to the south yields a magnificent view of the plateau above Parunuweap. Leave the saddle, hiking to the south, heading down hill. Its about .35 miles and 150 feet vertically to the bottom and into the wash below. The Arch - From the wash, turn to the east (left), and look for the beaten path. Going straight is the approach to Fat Man's Misery and Parunuweap Canyon. Continue walking in an easterly direction for a short time, hugging the southern tip of Checkerboard Mesa. While rounding the tip and looking east and north, three mountains will come into view. The center mountain is topped with juniper trees. We will call this unnamed mountain "6273," since this is how it is identified on some USGS 7.5 minute topographic maps. The large freestanding arch is on the left edge (west) of this mountain. Continue toward the arch, going up and over the saddle. Cross the main wash between Checkerboard Mesa and "6273" for a close up view of Checkerboard Arch. Exit - Return the same way hiked in or take the more difficult optional exit. Exit Option - For hikers that want to loop rather than double back there is an option, but its not an easy path to take. Continue north up the drainage between Checkerboard Mesa and Checkerboard Arch. Most of the route is steep, with a slippery downhill descent on the north side of the saddle. Bushwhacking could be a problem except in the winter. This alternate exit is 2 miles long which is the same distance as primary exit. Using this route to begin the hike would allow an early view of the arch. What is the difference between a free standing arch and a blind arch? A blind arch is an indentation in the side of rock that was formed by jointing. Blind arches are common in the park, but few are named. The Great Arch on the north side of the tunnel and Red Arch Mountain by the Zion Lodge are two exceptions. A natural arch is formed when natural forces cause rock to fall creating a natural or freestanding arch. The Kolob Arch in Zion is one of the world's largest natural arches, with a span of unsupported rock measuring 294 feet. Note: The main route to Checkerboard Arch is also part of one entrance to the magnificent Parunuweap Canyon route that leads through Fat Man's Misery and to the East Fork of the Virgin River. There are a few other natural arches in Zion National Park including Bridge Mountain Arch which can be seen at a distance from the Par'us Trail or the Zion Human History Museum. A natural arch on the floor of the canyon is also found along the Hidden Canyon Trail (and another high in the canyon few get to ever see) and a unique jug arch is found at the end of the Hidden Arch Trail. For those that venture into Zion's slot canyons there is an arch in the Subway (look up in the chamber where the log rests and another that can be swam through) and there is a unique arch in Fat Man's Misery along the Parunuweap Canyon Route.